In 1910, Albert E. Ferguson built this cast concrete-block building, on Morden’s Stephen Street, as a blacksmith shop. He continued blacksmithing here until the early 1940s. After the Second World War, the building housed a restaurant operated by Tom and Allan Clarke. Around 1958, it was successively a Chinese restaurant, shoe store, and children’s wear store. 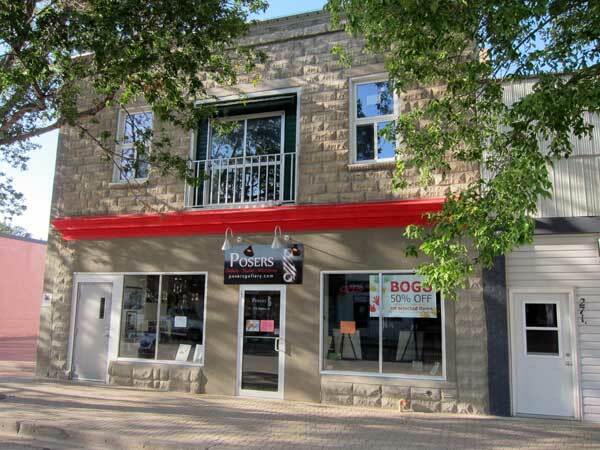 It became a flower and craft shop in 1987 and the present (2011) occupant, Posers Gallery, opened in August 2009. 275 Stephen Street, Town of Morden.